Student Rosemary holds a whelk shell drawing that she created during a 4-day, Level I workshop. In order to paint like me - or best, a better version of yourself - over the next couple of months I am giving a limited number of 2-day and 4-day workshops that will show you the foundational skills I employ in every single painting I create. I'll teach the basics, but there is far more involved in achieving excellence in representational art than having good hand-eye coordination. The most important skill you can develop is keen observation of form, shape, light, shadow, perspective and motion. 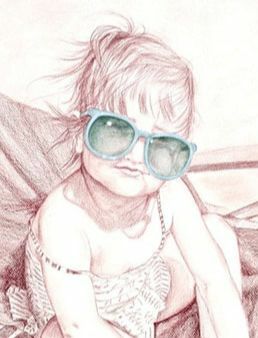 I’ll assist you every step of the way with careful guidance on technique, but more importantly I'll show you how to truly "see" your subject and translate what you observe into a drawing on a 2D surface that will look 3D. Once you've learned the basics in the 2-day or 4-day Level I courses, you'll have the option to go to Level II and tackle a variety of more complex subjects, with increased emphasis on achieving greater depth and luminosity. Each student of the 4-day and Level II workshops will be qualified to take my Level III workshop ~ using the skills you've learned to move into color. My goal is to help each of you to be the best you can be, no matter your starting point. I can't wait to see what you produce! Each workshop is limited to four students so I can give ample personal attention to each. Private lessons are available by contacting me directly. 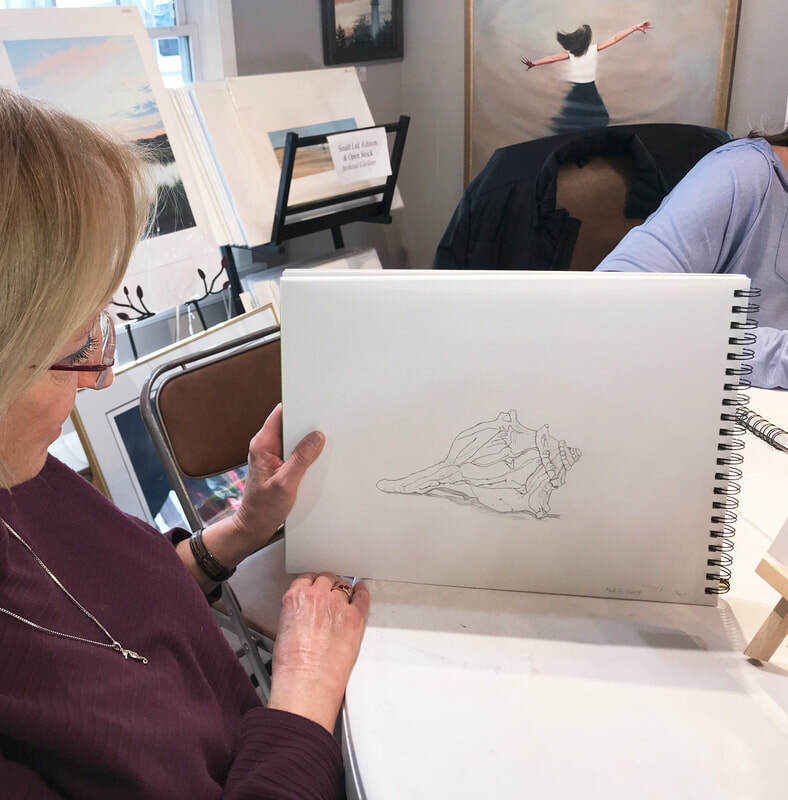 With all levels of workshop, you will come away with a better understanding of how to see your subjects and draw them more realistically, which will help you become a more proficient painter, no matter your style or chosen medium. Covers the basics of drawing using simple shapes. 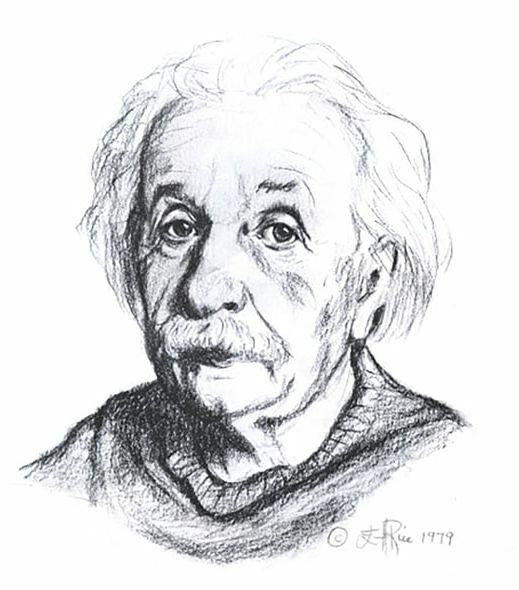 Concentration is on drawing with graphite pencils using one hardness. We will initially work from arrangements of real objects like eggs, less complex shells or other found objects. You will come away with a better understanding of "seeing" form, shape and shadow and translating that to paper. With two extra days, we will tackle more complex objects the second week. I will work with you every step of the way as you continue to learn to observe and interpret 3D subjects onto a 2D surface with pencil. Each student will work at their own pace. I've allowed days in between classes to allow for practice. 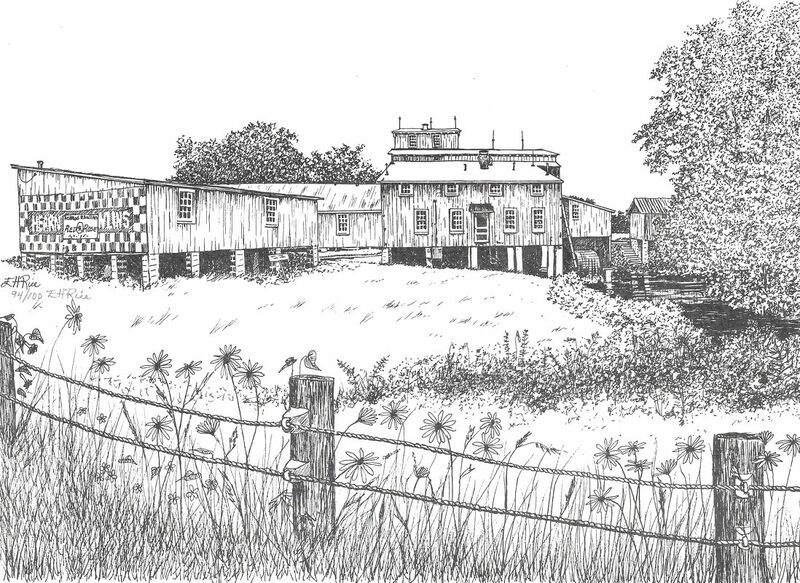 Whether your chosen subject is a scene with rolling waves, trees and marshes and/or a figure, this class will take your skills to a higher level, achieving increased depth and luminosity, using shadow, light and perspective to draw the viewer into your work of art. Further instruction on ways to observe your subject will be given. Questions will always be welcomed. With this 4-day course, working in color will be taught, still using dry media. More information will be provided after enough students have successfully completed Level II to fill a class. Everything learned in this class can be employed with various types of dry media, as well as water and oil media. Due to the limited size of the classes, a 50% non-refundable deposit must be made when you sign up. Full payment is required when signing up within one week of the workshop you're taking. All payments are non-refundable, but as long as you have a viable reason for cancelation and give at least 7 days notice, your fee can be used to cover a future workshop. I'll do everything I can to fit you in. Weather events of course preclude notice. Your fee can apply to any future workshops for which you qualify. ​Hours: 1 to 4 p.m.
Materials not included: see list below. Covers the basics of drawing using simple shapes as described above. Hours: 1 to 4 p.m.
Materials not included; see list below. Advances the student from simple shapes to more complex subjects as described above. Days between classes allow for practice. More information will be made available after enough students have completed Level I and II workshops to fill a class. For more personal, one on one time with me, private lessons can be arranged. Contact me by filling out the form on my contact page. Canson smooth surface 11" x 14" drawing paper. This paper erases cleanly and provides an even surface that can be used for beginning to advanced drawings in black and white or colored and pastel pencils. Available on Amazon here. Set of graphite pencils, erasers, pencil sharpener. I like this set because the graphite pencils are especially nice and the set also includes charcoal pencils and sepia pastel sticks, which can be used in Level II drawing, in addition to a pencil sharpener, a sanding block, two kinds of erasers and a blending stub. 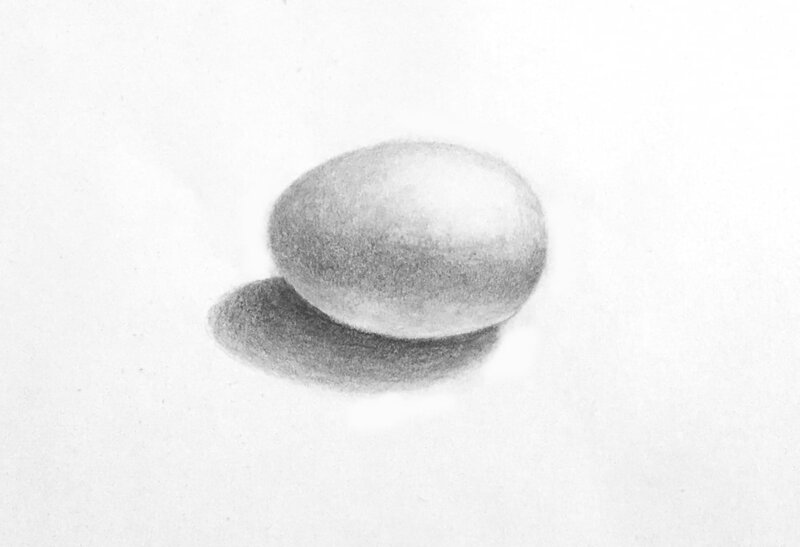 Egg pencil drawing, first workshop demo. Master the deceptively simple shading of the contours of an egg and you have the key to drawing realistic representations of many subjects, from birds and butterflies to waves and horses. 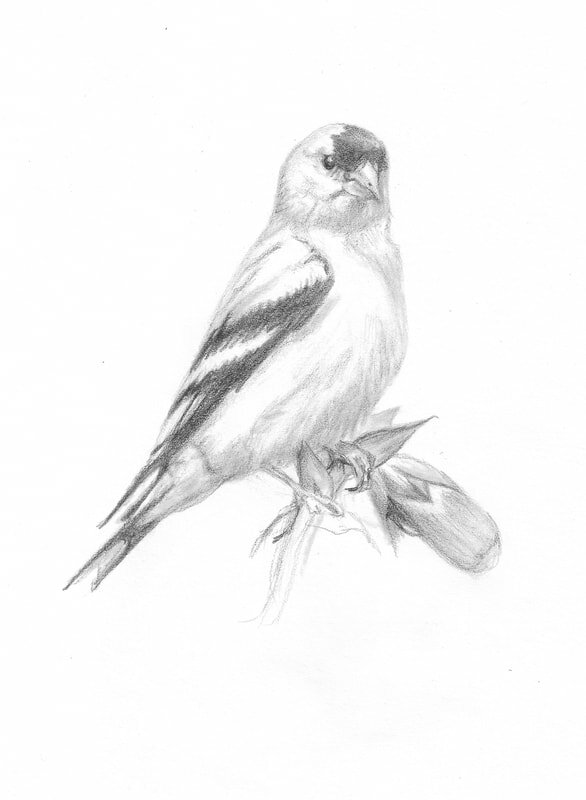 Nearing completion, graphite drawing of a goldfinch from second day of Level I 4-day workshop.